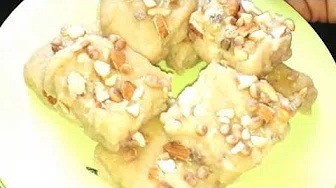 This rajgira burfi is specially made for fast. Here we are using rajgira flour to make it which is the main ingredient of this recipe and this rajgira flour mainly used for fast. We can also call it amaranth. To enhance its taste we are adding desiccated coconut in it. We all know that this rajgira have so much nutritional value itself. Protein, Carbs, Fat, Manganese, Magnesium, Phosphorus, Iron etc. Using some milk in it instead of only water. 1. Take a pan put 1/2 glass of water in it and boil it. 2. Take another pan put it on the flame and add ghee in it. 3. When ghee gets heated put desiccated coconut in it. 4. Stir it well till becomes some brownish in color. Then take out it from the pan. 5. Now again put some ghee in it and now add rajgira flour to it. 6. Roast it well. Till it changes its color. 7. Then add hot milk in it. Stir it continuously. Then add hot water in it. 8. When all the water get absorbed by the flour then put sugar in it mix it well and put lead on it. And cook it for 5 minutes. 9. After 5 minutes take out the lead and stir it again now add roasted desiccated coconut in it mix it well. 10. Now add nutmeg powder and chopped nuts in it. 11. Now take a trey to grease it with ghee and put all the batter in it and set it well. 12. Then put this trey into the fridge for about 1 hour . after 1 hour take it out from the fridge and cut the pieces of it. And take out the pieces in a plate. 13. Put this burfi in the air tiet pot and serve it when you want. 6. Roast it well. Till it changes it’s color. 13. Put this burfi in the air tyiet pot and serve it when you want.